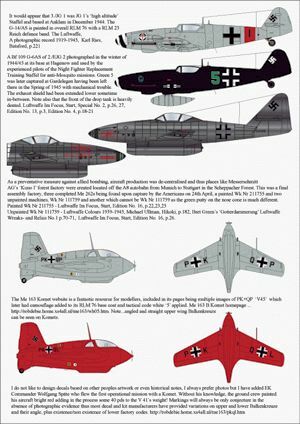 AIMS does not release decals that often, but when they do, the provide interesting subject and this potpourri of Messerschmitts is no exception. 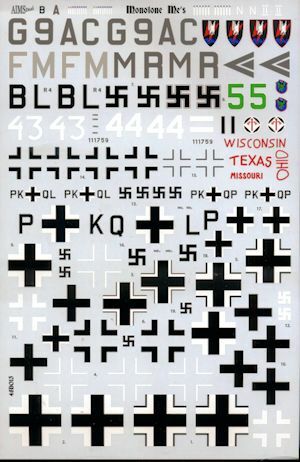 The theme behind this sheet are planes that are painted in a single color, something that perhaps will draw the attention of modelers who would rather not spend a lot of time masking and painting a complex camouflage scheme. The aircraft included are a nice mixture of types so let's have a look at what is included. First up are a quartet of Bf-110s. First is an all matte black Bf-110D-3 of 4./NGJ 1. Unlike many all black early 110 night fighters, this one is equipped with a FuG 207 radar set. Next is another matte black plane, this time a Bf-110D from 7./NJG 1 with yellow bands on the fuselage and lower wing, a marking carried for only a brief time. Another all matte black Bf-110E from II./NJG 1 in late 1940. THis plane was flown by the unit commander Hptm. Walter Ehle and sports his kills on the fin. Four Bf-109s are next with the first two being overall RLM 76 planes. White 43 and white 44 are both from 5./NJG 11. These Bf-109G-10 was used on anti-Mosquito missions. Both have black wing root fairings to help hide exhaust stains. Both have small main wheels and tall tail gear. The next 109 is a Bf-109G-14/AS with 3./JG 1 in late 1944 as part of their 'high altitude' staffel. It is also overall RLM 76 with the red Reich Defense band and a large white spiral on the prop. 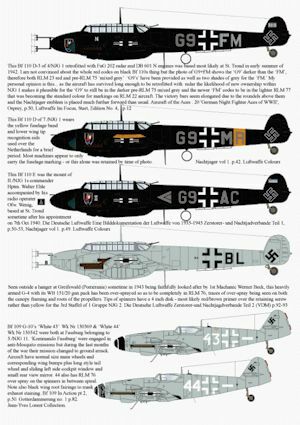 The last 109 on this sheet is an all black Bf-109G-6/AS from 2./EJG 2. This was used in the Night Fighter Training Staffel on anti-Mosquito missions. The drop tank is the only part of the plane that isn't black. 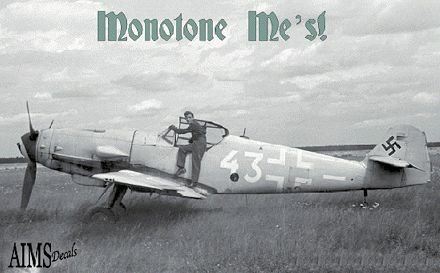 A completely unpainted Me-262 is next, this plane being found in April of 1945 by US troops. No markings other than those applied in paint by the troops. Finally, a pair of Me-163 Komets. The first is inn overall RLM 76 and is one of the large number of prototypes, V45. Next is the overall red Komet of Wolfgang Spate. This plane has never been photographed so all the markings (including the color) are based on personal anecdotes and speculation. However, it is a popular modeling subject. Fortunately, there are kits of all these planes in 1/48 scale, though conversions may be needed for some of the 109s if a kit cannot be located. The decals themselves are superbly printed and the instructions are first rate. Each entry has information on that particular plane as well as information on the source of the photo from which the scheme was derived. I have used AIMs decals in the past and they are superbly done.